to bring the extraordinary therapeutic riding to people sharing of our knowledge, and inspiration. Listed below are thm;e who contributed a11 El1rnu. :d Hember:;llip Gift, a Scholarship Gift, a Challenge Grant Gift, or a Corporate Gift to 11igh Hope,;; from July 1, 1992 to June JO, 1993. We are very grateful to those at. we are to tlw:.o who twve helped with their voluntuer given support to our J!Or$O Show and other cvenb, of the year, provided us wiUi countless gifts in kind. 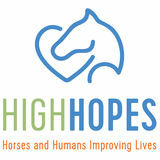 our 19th year of operation and our 3rd Center tor Therapeutic Riding we llre in tliere is simply no stopping us!! J ! High We informed you last year of the wonderful $100,000 Challenge campaign. The goal was to Grant to 1Jssist us in our capital match this grant dollar for dollar by December, 1992, In a fact, we not only matched tliis gift but exceeded it raiGing total of $256,000!l High Hopes has now completed its capital campaign and effective September 20, 1993 owns the building and land on which we reside. The support of over 300 volunteers throughout the program year, through involvement with the program, assistance to the staff, and the presentation of fundraising events. Working with the City of New Haven and the Volunteer Action center of New Haven to offer programs to 55 youth from the inner city as part of a crime prevention grant and program. Expansion of our summer camp programs to serve a new population of younger (age 5-7) special needs children working on fine and gross motor skills through a combination of therapeutic riding and a variety of other mediums to promote self expression and self esteem. The presentation of our Eighth 90 High Hopes riders. Host Site for the 1993 Connecticut Special Olympics Equestrian Games held on June 11, 1993. Over 40 athletes from throughout Connecticut competed in the event. Presentation of the 1st Annual Ghoulfest family fundralser in October, 1992. Reaching out and offering our programs and adults with special needs.